Kelani Abass. 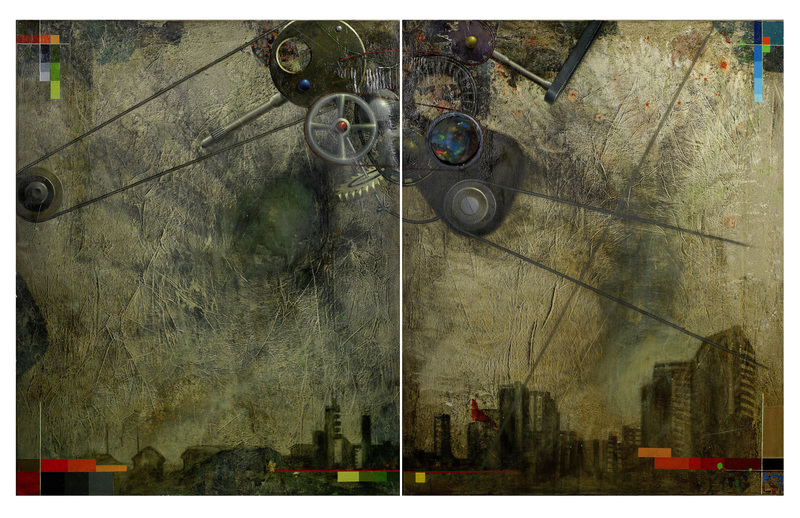 Irole [Family Album Series] (2013); corrugated cardboard, laminated print and acrylics on canvas; 59.8 x 96.5 inches (each). Courtesy of CCA Lagos. In this conversation he fluently conceptualizes what he has set to do, the reach of his rigor. His preoccupations—time and memory, history and archives—are worked out through photography, printing, and painting. The forms are often three-dimensional, and his methods occasionally require repeated use of mechanical tools. As a result, his work proffers complexity, a whole comprised of parts. Kelani’s recent work probes the shared history and character of man and machines through a wide range of media including sound. In addition to acrylics, oils, pastels and charcoal, Kelani also explores the possibilities inherent in painting, photography and printing to engage time and memory. This is the second installment of three interviews between MFA Art Writing professor and alumnus Emmanuel Iduma and Nigerian artists Kelani Abass, Taiye Idahor and Abraham Oghobase. The artists were featured in the exhibition CCA Lagos at ISCP, at the International Studio & Curatorial Program (ISCP) in Brooklyn, NY. Read the first interview with Abraham Oghobase here. CCA Lagos at ISCP, inspired by the 2016 exhibition Orí méta odún méta ibìkan (Three heads, three years, one place) at CCA Lagos, presents work from the archives of CCA Lagos as well as works in progress by Abass, Idahor, and Oghobase. The following conversation, conducted via email, has been edited for clarity. Kelani Abass. Family Portrait 1 (2016); acrylic and oil on canvas. Emmanuel Iduma: When people call you a “painter’s painter,” what do you think they mean by that? Kelani Abass: Being called a painter’s painter refers to one whose painting is pushing beyond limits, experimenting, research-oriented, broadening the possibilities of painting, stimulating minds and questioning conventional trends. EI: In Salzburg, you began the series Stamping History by making a portrait of Mozart using a stamp machine, and ended up with several self-portraits. Why did you begin with Mozart, and how did you end up with yourself? KA: The Mozart piece, titled Portrait of Salzburg, was done in Austria with materials found on the streets of Salzburg and the numbering machine which I took with me to Salzburg from my family archive, while the self-portrait Stamping History 1–6 was done in Nigeria after the residency, with watercolor as a base for numbers. These are separate pieces from one body of work. Experiencing Austria for the first time, I found it fascinating how Mozart has been immortalized in the streets of Salzburg with his portrait engraved on almost everything possible such as monuments, chocolate bars, foot mats, public squares…just to mention a few. These represent traces of the past in the present. The numbering device used to create the portrait prints works in ascending order, which could indicate how impactful objects are in our lives as well as how we use them as mechanisms to navigate our feelings, retentions and progress. Kelani Abass. 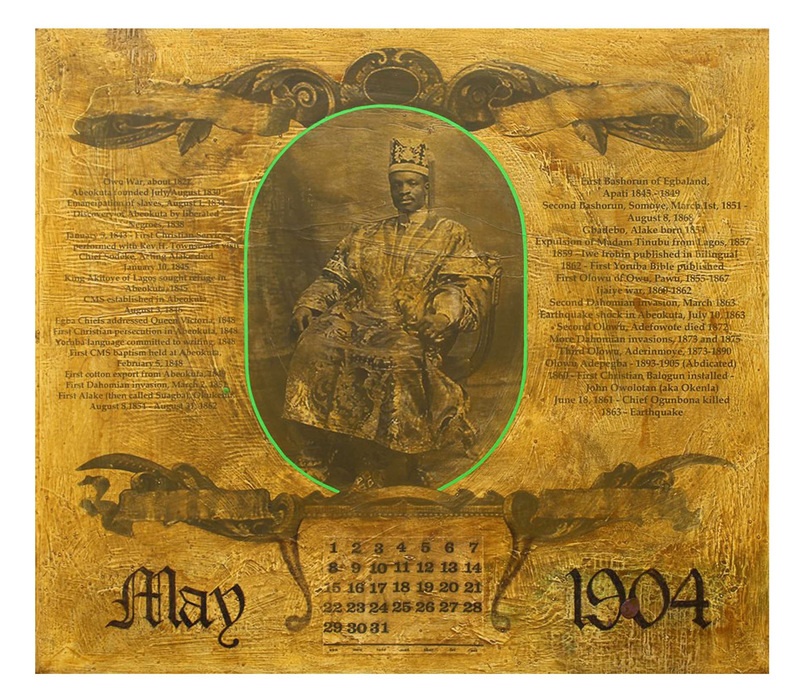 Oba Gbadebo 1 [Calendar Series] (2016); corrugated cardboard, laminated print, charcoal, and acrylic on canvas; 41.3 x 48 x 2.4 inches. KA: The act of stamping, of the mark making process, indicates a continuous and repetitive activity, it is a testament to the contact between the machine and me. Stamping as a process has been an integral part of my development as an artist, especially because of my letterpress printing background, which is predominantly about making impressions. I grew up using this machine as a numbering tool on invoices and receipts. Now it has become a drawing tool; it has ability to keep a record of time, to make inscriptions of the past in the present, and it has capacity to mimic time through its performativity. EI: What I find most promising about your portraits is the use of numbers as lines, and as matter. It immediately occurs to me that you “contain multitudes,” to quote the famous Whitman line. In the Salzburg show, you repeatedly imprinted 1756, the year of Mozart’s birth. At the ISCP in New York the numbers are longer and varied. What increasing significance do numbers hold for you? KA: Numbers have been of immense value to me as they date back to the origin of matter and keep memory alive as a domestic ritual. To be ardent about my impressions and to document at the same time through the numbering process, affirms my contact with the machine. I utilize numbers starting from zero to infinity creating density, which, for me, is the best way to understand time. In Portrait of Salzburg, I make use of the numbering machine starting from 0 to 1756, progressively (without repetition), which ended at the year of his birth, on the same paper I added a collage of other materials that feature the pictures of Mozart. EI: In your recent exhibitions at Centre for Contemporary Art (CCA), Lagos, you have used materials—such as old typewriters, photo albums, and printing cases—to reinvigorate time and to work against obsolescence. What is behind the urgency of this kind of work? Why do you keenly engage with the nature of passing time? Kelani Abass. 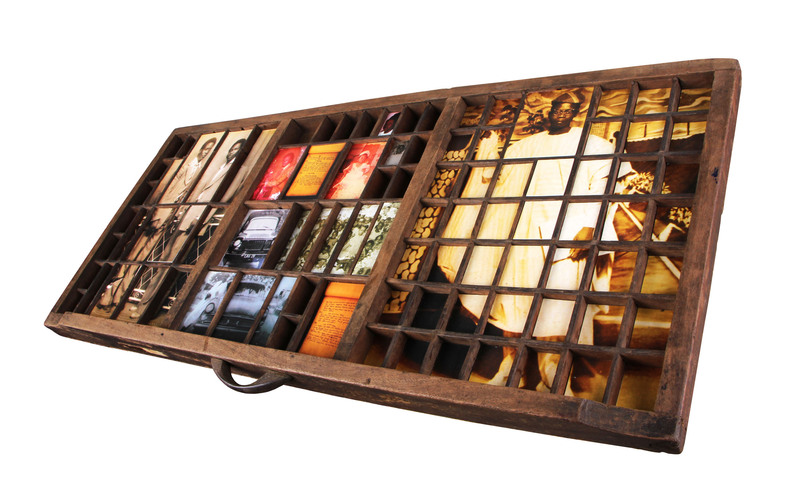 Casing History 1 (2016); letterpress type case and digital prints; 14.2 x 32 inches. Kelani Abass. Casing History 18 (2016); letterpress type case and digital prints; 14.2 x 32 inches. 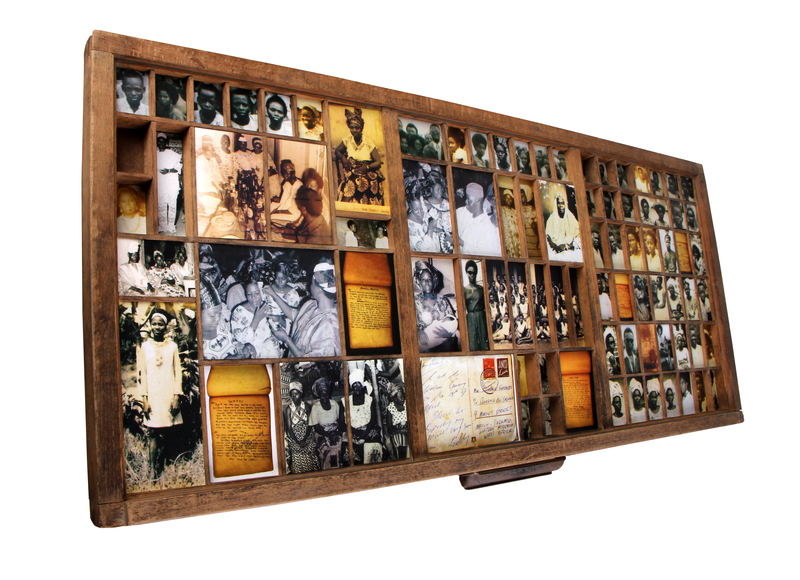 KA: In 2012, after I participated in History/Matter, a residency program that focuses on technique and methodology, critical thinking, and implementation of conceptual ideas at CCA, Lagos, I visited my family home where all the archival materials collected by the family printing press were kept. I found a lot of these materials already destroyed, damaged, and thrown away, while some are still in good condition, and I realized the need for me to reclaim these materials. The urgency of this work is needed. As we have seen in recent times, technological advancement has been sweeping through our heritage and cultural essence. Technology is increasingly gaining ground in different aspects of development. These materials are repurposed to take our minds down memory lane. The appetite of modernization in 21st century is quickly eating into the quality of our interaction with history in relation to transition from one phase to another. The advancement we are seeing as the result of these changes has a place in the past. By positioning time as oddity, I hope to provoke thoughts about the derivation of this leap, raising the value of the now. EI: When you talk about “our interaction with history,” I assume you are speaking, at least in the immediate sense, with a Nigerian audience in mind. KA: Looking at it from a global stance, it cuts across the board: how we have evolved with history as a medium of relation; how we have moved from where we were to our present position; and how we have amalgamated our personal narratives into collective history. EI: What specific histories, or personal narratives, are you thinking about? KA: History expresses itself from a universal view where there are previous records as guides to the present happenings, merging our individuality into a singular identity. The archival images, the journal put together by my family, and the type-cases from the printing press used in my works are all from my personal archive, but the information they provide is of global relevance. EI: Can you tell me more about growing up around a printing press? Did that have an impact on your decision to make art? KA: I grew up with my siblings and apprentices at the family letterpress printing press and typing/shorthand commercial Centre in Abeokuta. This was at the time when analogue printing was giving way to digital printing. My first task at the press was to learn how to memorize type-cases for easy and faster composition of documents, to be able to differentiate font sizes and characters as well as distinguishing sizes of quotations and reglet (a metal or wooden object used for measurement in letterpress printing). I had access to a lot of creative resources including papers, color materials, printing inks, etc. Handling the machines at the printing press, some of which were bigger than I was then, required a measure of safety and was quite an interesting practice for me as I began to familiarize myself with them and the skill required to operate them. I became keen to explore them further. Soon I was using them to create colorful designs and prints that transcended the original input. In the late 1980s, my father would travel to Lagos to make computer artworks for lithographs and offset printing. I was given the opportunity to work directly with him because of my inquisitiveness. This exposed me to creating artworks for that would ultimately be produced through offset printing. All this culminated in my drive and enthusiasm for art making. Kelani Abass. 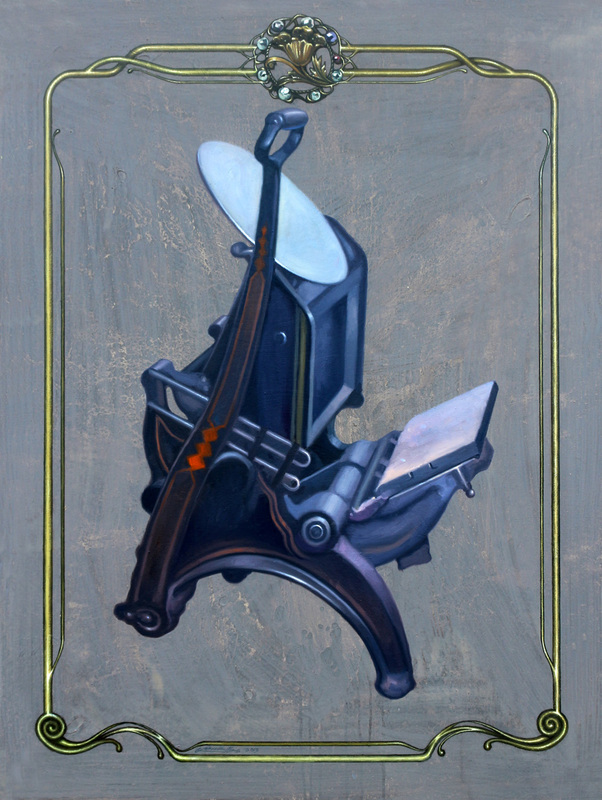 Man and Machine I [diptych] (2011); oil and mixed media on canvas. 59.8 x 96.5 inches (each). EI: What has been most thrilling for you in working with printing, painting, and photography? What prospects do the juxtaposition of these mediums continue to hold for you? There is a connection between painting, printmaking, and photography: the process of printing is similar to that of photography for instance; the method of exposing photographic film can be compared to the one of lithography in offset printing, the old daguerreotype can be likened to a metal block used in reproducing images in letterpress printing. Photography has been seen as a threat to painting, but I recognized photography as an invaluable aid, using it either directly or as a reference in my work. As an artist that engages archives, the use of photography coupled with printing techniques is highly important in my practice today; these three are convoluted aspects of my life and growth. I am accelerating my prior experience as a printer into the present as a painter with the aid of technology, which is motivated by the possibilities of the future.